Shortly after we published our giant sales report, Defender's Quest: By the Number, part 2, the Steam Linux client officially went public and was accompanied by a site-wide sale. The Linux sale featured every single Linux-compatible game on the service, including Defender's Quest. In preparation for this article, I asked the good people of Reddit's /r/linux_gaming subreddit what sort of data they'd like to see, and today I'd like to answer both their questions and yours. As for the Linux sale, there were only about 50 or so games that took part, a small enough number that every single one of them could share equally in the spotlight of the main sales promotion page. The question on everybody's mind is : how many Linux users are there anyway? Apparently a lot. I was surprised to see nearly three times as many Linux sales as Mac sales, as conventional wisdom has it that Linux is a much smaller market than Mac. There's several possible explanations for these results - pent-up demand from Linux users, Defender's Quest being one of only a handful of Linux games available, and the Linux theme of the promotion itself. There's also the possibility that we've simply been under-estimating the Linux market all along (especially considering the results from the various Humble Indie Bundles). As a quick aside, the fact that our game is multi-platform has generated bonus revenue above and beyond what we've earned from Mac and Linux users. If not for our Linux build, we wouldn't have been invited to the Steam Linux sale, and the majority of that came from Windows users. Methodology matters just as much as raw data, so here's how Steam calculates "linux" and "mac" users: "Mac/Linux sales are based on platform of purchase; or after 7 days, the platform with the most minutes played." That's pretty straightforward, except for an ambiguous edge case - what happens if someone buys the game on Windows, plays for a minute, and then logs 60 hours on their Linux box 10 days later? Are they counted as a Windows user or a Linux user? (I've written to Valve for clarification on this). I'm not sure there's enough cases of this sort of thing to grossly affect the data. UPDATE: Valve confirms: "Hi Lars, Great question. The correct interpretation is #1, steam looks at the player’s play time and reassigns their platform category once and for all." In any case, data from a one-week, Linux-themed sales period isn't exactly typical, so I compared these results to our lifetime direct (non-steam) sales stats. These numbers only account for sales made directly through www.defendersquest.com. Whenever someone purchased the game from our site, they got links to Windows, Mac, and Linux builds of the game. Our storefront software, FastSpring, tracks how many times users click on each link. 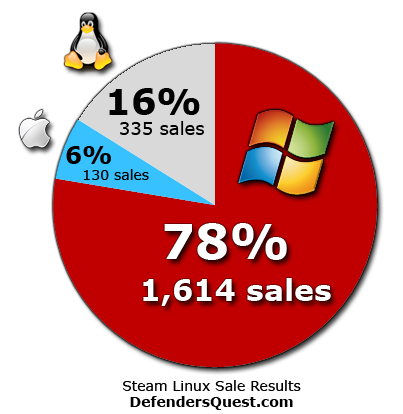 Just as on Steam, Windows clearly dominates, and at least for our direct sales, Mac has a slight lead over Linux. Our Linux builds came in three flavors - DEB, TAR.GZ, and RPM, to accommodate the various different Linux distributions. Of these, the DEB package accounted for 52% of downloads, the TAR.GZ had 36%, and the RPM package came in last at 11%. This data set accounts for overall download attempts, not individual users. Our storefront provider, FastSpring, lets user download each file up to 6 times before a fixed expiration date, after which we have to manually reset the link at the customer's request. (Needless to say, this "feature" makes me want to replace FastSpring at the first opportunity). One thing to keep in mind is that our game is built on Adobe AIR, which Linux users famously hate with a passion (along with Flash). Since Adobe dropped support for AIR on Linux after version 2.6.0, Linux users have had to manually install the run-time, which can be a painful and error-prone process. To aid them, we created a special help page with step-by-step instructions, and put a prominent link to it on the front page of our site. For the Steam build, my wonderful Linux guru Alexander Sturm was able to create an easy-installer script that provides all of the dependent libraries Adobe AIR needs, and then installs it with one simple click when you first launch the game from Steam. This works great on most distributions - especially Ubuntu and Mint, and we're ironing out the kinks with decent success for more obscure distros like ARCH. So, keep in mind that our Linux sales could have been higher if we weren't bearing the stigma of Adobe AIR. (One of many reasons I'm seriously looking into using Haxe for our next project). Last week on this reddit thread and Twitter I initially reported that our direct Linux downloads were about twice that of Mac, but clearly I had miscalculated -- my apologies! 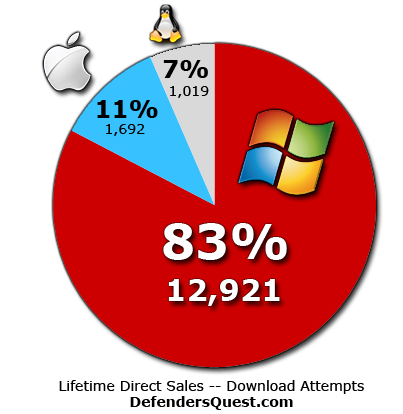 Still, all together Mac and Linux represent 18% of our direct revenue, and Linux revenue is not far behind Mac. The results from the Steam Linux sale clearly put Linux over Mac, though only time will tell whether it maintains this lead moving forward. Since I like to use technologies that makes it easy to target multiple platforms, I don't have to put an enormous amount of effort into "porting" a game to Mac or Linux. It's usually just a matter of changing the export settings on my compiler and doing a little troubleshooting when per-platform bugs crop up. I'd estimate we spent less than $1,000 worth of labor getting our game to run on Linux. All in all, that's a small price to pay for what turns out to be a significant chunk of revenue. Maybe Linux gaming will take off, maybe it won't. Maybe the Steambox will be a huge game-changer, and we'll reap the benefits of being a launch title, or maybe not. Whatever the case, I see three things in the Linux gaming community: a passionate and under-served market, little competition, and plenty of room for growth. That's the perfect place for an indie to be. I've been thinking about writing, journalism, and Youtube a lot lately, and I just realized something: we're moving to a new form of "writing" based on recorded oral culture.Traditionally, "
Today a bit of a personal post.We have been pretty successful with Defender's Quest as of late, being fortunate enough to get on Steam, GOG, and reap the benefits of that attention.